Our recent story on GM crops evoked the biggest response to date. This week we’ve asked the Chief Executive of AfriBio – funded by South African and foreign organisations – to respond. AfricaBio lobbies for GM crops in Africa and beyond.This contribution does not reflect the views of The Journalist and has been shortened. Plant biotechnology is playing a significant role in helping small-scale farmers improve their incomes and quality of life. In 2013, of the 18 million farmers worldwide growing 175 million hectares of biotech crops, 90 percent were small holder farmers in developing countries, according to the International Service for the Acquisition of Agri-Biotech Applications (ISAAA). Biotechnology, while not the complete answer to food insecurity at the household level in South Africa, can help to ensure that nobody goes to bed on an empty stomach. Smallholder farmers – who make an important contribution to food production in South Africa – increasingly need better farming methods to increase their yields. In return, the farmers can ensure higher incomes to better cater for the needs of their families. Some have found the answer in growing GM maize. Our farmers consider the main benefits of GM maize to be peace of mind, consistent increased yields, better grain quality and excellent weed control. Bubbi Aphane with her GM maize crop. Dr Mamabolo Raphesu is a former lecturer at the Limpopo University who gave up his academic career for full-time farming. 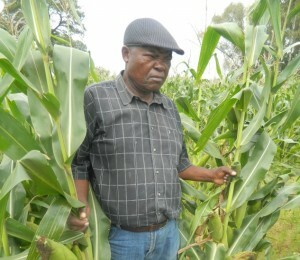 He has 120 ha of GM maize and started farming five years ago. “It keeps my maize free from stalk borer infestation and weeds are easily managed. GM maize is a jump starter for smallholder farmers who want to achieve food security and a better living,” says Raphesu. His average yield over the years has been three to four tons per hectare. 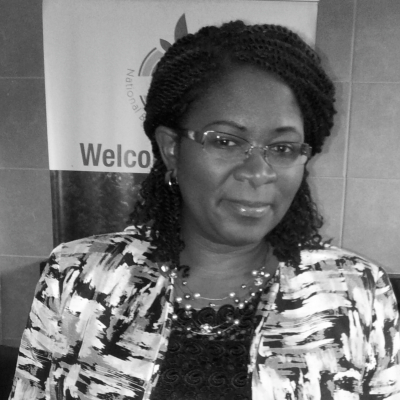 Dr Raphesu is a past president of AFASA (African Farmers’ Association of South Africa) for the Gauteng Province. 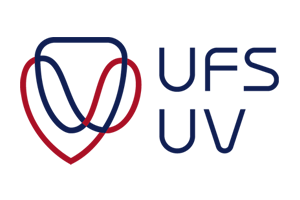 Tepsy Ntseoane, a former teacher and business consultant to various institutions, is the president of African Farmers’ Association of South Africa (AFASA) for the Gauteng province. She farms on 539 ha with cattle, maize, vegetables and pigs. She obtained the land from the government through the Land Reform Strategy. Her GM maize yield the past season, suffering severe drought spells, was 5.37 tons per hectare. 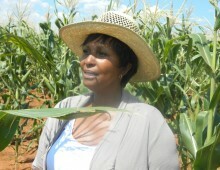 In 2011 AfricaBio introduced her to GM maize. “My yield was 7 tons per hectare compared to two to three tons per hectare with conventional maize. I am so impressed with having no stalk borer damage and no weed problems that I plan to increase my plantings to 100 ha. GM maize, from my own experience, is certainly the answer to food security, hunger and poverty alleviation for smallholder farmers,” says Ms Ntseoane. 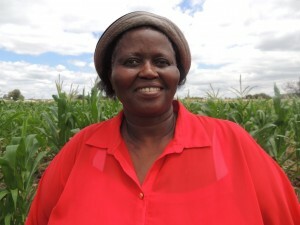 Motlatsi Musi who has addressed several European institutions on the benefits of GM crops, including the European parliament in Brussels, was introduced to GM maize in 2004. “My yield on dry land increased by 34%… From the increased income I gradually extended my planting from 7 ha to the current 20 ha. My average yield over the past nine years, during some critical drought periods and floods, has been 5.5 to 7 tons per hectare. 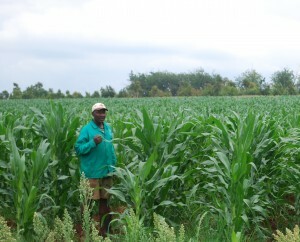 During the 2012/13 season I planted GM white maize and my yield was 5.5 tons per hectare. From surplus maize which I harvested, I donated six bags of mealie meal to an old age home and an orphanage in Soweto,” says Musi. In 2008 he was invited by the Brazilian Council for Biotechnology Information (CIB) to address the Rural Coopaval Show held in Parana State on the benefits of GM crops he has experienced. 2013 was the 18th year of successful commercialisation of GM crops. Globally, a record 18 million farmers grew GM crops and over 90% or more than 16.5 million were small resource-poor farmers in developing countries. In South Africa, about 2.9 million ha of GM maize, soybean and cotton were grown in 2013. The economic gains from GM crops for South Africa for the period 1998-2013 was estimated at US$1.15 billion (R 12.4-billion) and US$ 218.5 million for 2012 (R 2.36-billion). I would like to emphasise that all officially approved GM crops do not represent any greater health threat to consumers than their conventional counterparts. In South Africa, genetically modified (GM) crops are the most extensively tested food crops available. They are more stringently tested than any other food in history, and are tightly regulated both before they reach the marketplace and once they are on sale. Biotech crops have been grown and consumed for more than 18 years and people around the world have consumed billions of meals containing biotech derived foods or ingredients. AfricaBio, is a biotechnology stakeholder association established in 1999, and works with stakeholders along the value chain to ensure, safe and responsible adoption of biotechnology in South Africa and the region. Activists from around the country are gearing up for a national dialogue on the right to food. 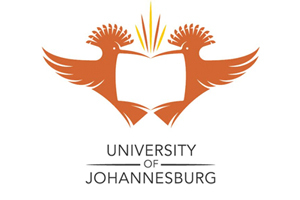 They plan to inspire a movement for food sovereignty in South Africa.The African Centre for BioSafety, in collaboration with the Foundation for Human Rights, will host the dialogue on 29 and 30 November in Johannesburg. South Africa is the only country in the world that has allowed its staple foods to be genetically modified (GM). “The majority of South Africans are not only eating GM maize without their knowledge and consent but have no choice or alternative whatsoever even if the products were correctly labelled. This is totally undemocratic and unacceptable. It smacks of outright food fascism” said Mariam Mayet, Director of the African Centre for Biosafety. In July 2012 the National Chamber of Milling (NCM) posted a ‘position on Genetically Modified Organisms (GMOs) on its website, in which it supports the principle of consumer choice and pledges to ‘encourage identity preservation within the grain supply chain to enable clear labelling of our product to the consumer market’. However, the biotech industry lobby group AfricaBio, who have lobbied vociferously against the labelling of GM food in South Africa, has also claimed to have ‘forged a strategic partnership with the NCM’ to engage with government on the GM labelling issues. 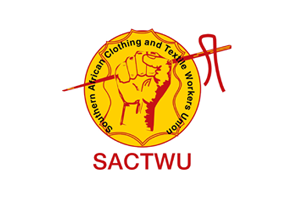 That being the case, the ACB has written an open letter to the NCM asking for clarification of its relationship with AfricaBio, to push for a stringent and accurate labelling and identity preservation system (including establishing GM free maize and soya chains) and supporting the independent, long term and transparent risk assessment of GMOs in South Africa.